DNS can be applied to IoT, but it probably won’t boost second-level domain registrations. The U.S. Patent and Trademark Office has granted patent number 9,935,950 (pdf) to Verisign (NASDAQ: VRSN) for “Systems and methods for establishing ownership and delegation ownership of IOT devices using domain name system services”. I have long searched for ways in which domain names can be used for connected devices, e.g. The Internet of Things. I have yet to find any good examples in which domain names are better than alternative technologies for accessing the devices. Nevertheless, there are certain aspects of the domain name system that could be applied to IoT. Provided is a method for establishing ownership of a component of an internet of things (“IoT”) device. 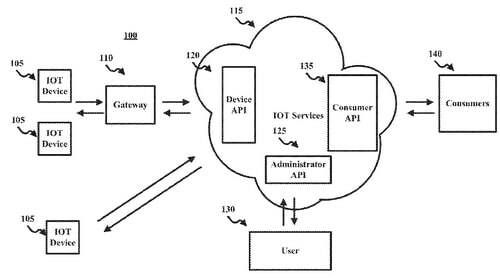 The method comprises receiving, at a registration service, a request to register the component of the IoT device, the request comprising a public key of the component of the IoT device, an identifier of the component of the IoT device, and a public key of an owner of the component of the IoT device; determining a qualified name for the component of the IoT device based on a name associated with the owner of the component of the IoT device; generating one or more domain name system (“DNS”) records for the component of the IoT device, the one or more DNS records comprising an authentication file that identifies a chain of ownership of the component of the IoT device; and storing the one or more DNS records in a registry. For example, the IOT service 115 can establish a domain for IOT devices such as “.iotservice.com.” As the devices are registered with the IOT service 115, the IOT service assigns the domain name and creates the DNS records for the IOT devices. For example, if the IOT devices 105 are owned by “Company A,” the IOT service can create a domain “companyA.iotservice.com.” The IOT service 115 can assign a unique domain name to each of the IOT devices, for example, “iotdevice1.companyA.iotservice.com.” The domain and the domain names for each of the IOT devices allow consumers 140 to locate and communicate with the IOT devices 105. Note that this example doesn’t include a new second-level domain registration for each device. That would be ill-advised for domain names that fall under ICANN’s regulations (cybersquatting, annual fees, etc.). We have over 50 connected devices in our house. We access them with our voice, apps and routines/recipes, not domain names.